Political, civic and academic leaders from New York, Vermont, and Maine visited Montreal September 25 to learn about Consulate operations and meet counterparts from the province of Quebec. Local guests included members of parliament, political attachés, educators, business leaders and representatives of the Mohawk Nation. 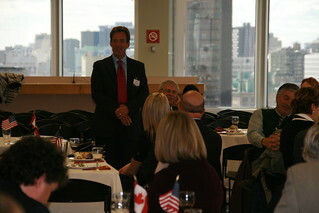 Visitors were offered a behind-the-scenes tour to better understand consular services offered, and all had a chance to make cross-border connections during a luncheon and discussion in the afternoon.